“The Commission should not approve the merger without verifiable and enforceable commitments by the Applicants to ensure that the transaction does not cause a reduction in U.S. employment, that no employees of T-Mobile or Sprint will lose a job as a result of this transaction, that the Applicants will commit to return all overseas customer call center jobs to the U.S., that the Applicants commit to abide by all labor and employment laws, and to maintain neutrality in allowing their employees to form a union of their own choosing, free from any interference by the employer." First, the merger would result in the loss of more than 28,000 jobs across the United States and combine two companies with a long history of labor and employment law violations. Contrary to unsubstantiated claims of merger-related job creation, leading Wall Street analysts predict that massive job cuts from the elimination of duplicative retail stores and headquarters functions at the New T-Mobile will contribute significantly to the billions of dollars in projected merger “synergies.” Consistent with analysts’ predictions, CWA performed a comprehensive analysis based on detailed location data for all the retail locations involved in the proposed transaction. 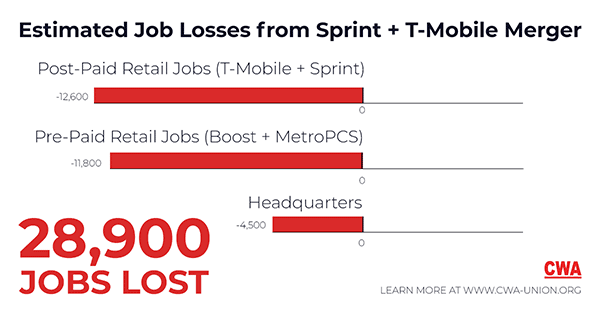 Our analysis finds that the proposed T-Mobile/Sprint merger will result in the loss of more than 28,000 jobs. Approximately 24,000 jobs would be eliminated as a result of overlapping retail store closures at both post-paid and pre-paid (e.g. Boost and MetroPCS) Sprint and T-Mobile locations. Another approximately 4,500 jobs would be eliminated due to duplicative functions at corporate headquarters in Overland Park, KS and Bellevue, WA. The proposed merger also would combine two companies with a long history of violation of employment law and workers’ rights. T-Mobile has been found guilty of violating U.S. labor law six times since 2015 and has been subject to approximately 40 unfair labor practice charges since 2011. Moreover, both Sprint and T-Mobile offshore a significant portion of call center work to Philippines, Guatemala, Honduras, India, Mexico, Panama, the Dominican Republic, Costa Rica, and Canada. Second, the proposed horizontal merger of T-Mobile and Sprint raises serious competitive concerns. The transaction would eliminate the substantial head-to-head competition that currently exists between T-Mobile and Sprint. A merger between firms selling differentiated products may diminish competition by enabling the merged firm to profit by unilaterally raising the price of one or both products above the pre-merger level. Additionally, the FCC has long recognized that spectrum is an important input for wireless service and conducts an initial spectrum screen to determine if a proposed transaction raises competitive concerns regarding this key input. The screen is triggered when a wireless provider would hold approximately one-third or more of the suitable and available spectrum. The “New T-Mobile” would exceed the spectrum screen in almost two thirds of the counties in the United States, with a full 92 percent of the population of the United States – 284 million people – living in counties in which the spectrum screen would be exceeded post-merger. The merged company would exceed the FCC’s spectrum screen in every one of the 100 most populous counties in the US. Third, the Applicants have not come close, by any stretch of the imagination, to providing the kind of evidence that is sufficiently rigorous and well documented to satisfy the Commission’s high evidentiary standard to prove verifiable public interest benefits that will result from the merger. The Applicants fail to prove their assertion that neither Sprint nor T-Mobile can effectively compete as standalone firms, and specifically that neither can “win” the race to deploy a next-generation nationwide 5G network. Upon closer inspection, this rationale falls apart for two key reasons. First, both companies are viable on a standalone basis and are already in the process of improving their networks, including their ability to provide initial 5G services. Neither company needs the proposed transaction to be an effective competitor in the future. Second, the Applicants fail to prove their assertion that neither stand-alone Sprint nor T-Mobile can effectively deploy a next-generation nationwide 5G network. Finally, Applicants have made no showing that the merged firm would have either the incentive or ability to provide hallmark 5G services outside of densely-populated areas. The proposed merger does not change that reality for rural America. Fourth, the merger raises serious national security concerns regarding possible integration of Chinese government-owned Huawei and ZTE equipment in their networks. In 2013, Japanese company SoftBank’s purchase of Sprint and its then majority-owned subsidiary Clearwire resulted in a National Security Agreement requiring both companies to remove Huawei equipment from their networks. However, Sprint and Boost Mobile continue to utilize Huawei infrastructure and sell ZTE devices, and Sprint executives have even publicly praised them despite national security concerns. Consequently, the Commission should consider the history of collaboration between Sprint’s Japanese owner, SoftBank, and Huawei and ZTE and ensure that Sprint fully complied with the 2013 NSA agreement.